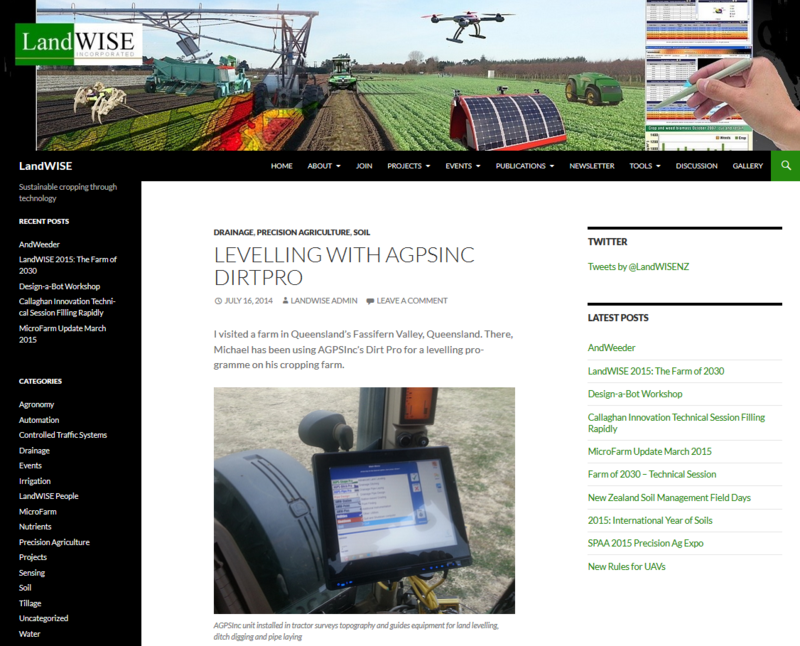 OptiSurface in Press: Landwise Inc. - Levelling with AGPSInc Dirt Pro – Welcome to the OptiSurface Support Center! I visited a farm in Queensland’s Fassifern Valley, Queensland. 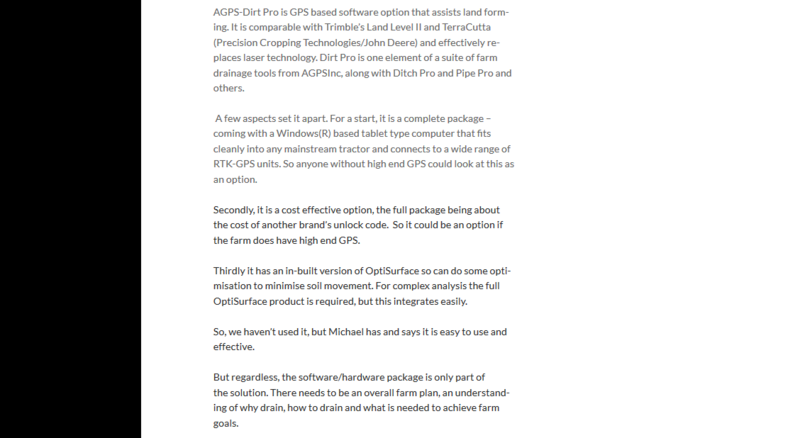 There, Michael has been using AGPSInc’s Dirt Pro for a levelling programme on his cropping farm. AGPS-Dirt Pro is GPS based software option that assists land forming. It is comparable with Trimble’s Land Level II and TerraCutta (Precision Cropping Technologies/John Deere) and effectively replaces laser technology. Dirt Pro is one element of a suite of farm drainage tools from AGPSInc, along with Ditch Pro and Pipe Pro and others. A few aspects set it apart. For a start, it is a complete package – coming with a Windows(R) based tablet type computer that fits cleanly into any mainstream tractor and connects to a wide range of RTK-GPS units. So anyone without high end GPS could look at this as an option. Secondly, it is a cost effective option, the full package being about the cost of another brand’s unlock code. So it could be an option if the farm does have high end GPS. Thirdly it has an in-built version of OptiSurface so can do some optimisation to minimise soil movement. For complex analysis the full OptiSurface product is required, but this integrates easily. So, we haven’t used it, but Michael has and says it is easy to use and effective. But regardless, the software/hardware package is only part of the solution. There needs to be an overall farm plan, an understanding of why drain, how to drain and what is needed to achieve farm goals. The broad, shallow, grassed drains at the ends of Michael’s paddocks are his headlands. This approach has application in New Zealand and is another thing to follow up. Why do we have impassable deep, narrow sprayed out ditches that erode and require headlands on either side, when a grassed swale can be driven over, used as a combined headland, and generate less sediment and maintenance?